Periodic trends for ionization energy (Ei) vs. atomic number: note that within each of the seven periods the Ei (colored circles) of an element begins at a minimum for the first column of the periodic table (the alkali metals), and progresses to a maximum for the last column (the noble gases) which are indicated by vertical lines and labelled with a noble gas element symbol, and which also serve as lines dividing the 7 periods. The maximum ionization energy for each row diminishes as one progresses from row 1 to row 7 in a given column, due to the increasing distance of the outer electron shell from the nucleus as inner shells are added. where X is any atom or molecule capable of ionization, X+ is that atom or molecule with an electron removed, and e− is the removed electron. This is generally an endothermic process. Generally, the closer the outermost electrons are to the nucleus of the atom , the higher the atom's or element's ionization energy. The sciences of physics and chemistry use different measures of ionization energy. In physics, the unit is the amount of energy required to remove a single electron from a single atom or molecule, expressed as electronvolts. In chemistry, the unit is the amount of energy required for all of the atoms in a mole of substance to lose one electron each: molar ionization energy or enthalpy, expressed as kilojoules per mole (kJ/mol) or kilocalories per mole (kcal/mol). Ei generally increases as one moves from left to right within a given period (that is, row). Ei generally decreases as one moves from top to bottom in a given group (that is, column). The latter trend results from the outer electron shell being progressively farther from the nucleus, with the addition of one inner shell per row as one moves down the column. Number of electron shells: the greater the size of the atom less tightly the electrons are held by the nucleus and ionization energy will be less. electron systems. Calculating these energies exactly is not possible except for the simplest systems (i.e. hydrogen), primarily because of difficulties in integrating the electron correlation terms. Therefore, approximation methods are routinely employed, with different methods varying in complexity (computational time) and in accuracy compared to empirical data. This has become a well-studied problem and is routinely done in computational chemistry. 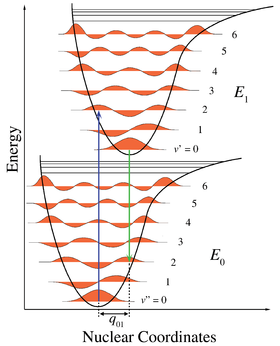 At the lowest level of approximation, the ionization energy is provided by Koopmans' theorem. For a diatomic molecule, the geometry is defined by the length of a single bond. The removal of an electron from a bonding molecular orbital weakens the bond and increases the bond length. In Figure 1, the lower potential energy curve is for the neutral molecule and the upper surface is for the positive ion. Both curves plot the potential energy as a function of bond length. The horizontal lines correspond to vibrational levels with their associated vibrational wave functions. Since the ion has a weaker bond, it will have a longer bond length. This effect is represented by shifting the minimum of the potential energy curve to the right of the neutral species. The adiabatic ionization is the diagonal transition to the vibrational ground state of the ion. Vertical ionization may involve vibrational excitation of the ionic state and therefore requires greater energy. ^ "Ionization Energy". ChemWiki. University of California, Davis. 2013-10-02. ^ Cotton, F. Albert; Wilkinson, Geoffrey (1988). Advanced Inorganic Chemistry (5th ed.). John Wiley. p. 1381. ISBN 0-471-84997-9. ^ "ionization potential". IUPAC gold book. ^ Lang, Peter F.; Smith, Barry C. (2003). 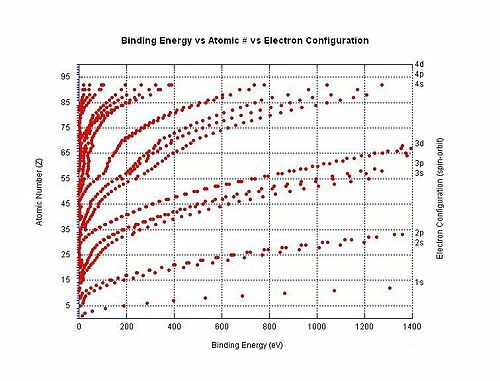 "Ionization Energies of Atoms and Atomic Ions". Journal of Chemical Education. 80 (8): 938. Bibcode:2003JChEd..80..938L. doi:10.1021/ed080p938. ^ "The difference between a vertical ionization energy and adiabatic ionization energy". Computational Chemistry Comparison and Benchmark Database. National Institute of Standards and Technology.